An overview of relevant Planning Policy Documents and related information both historic and current that should be considered in context of planning applications in Bleadon when making comment. "The town and country planning system shapes new building all over the country. It can protect the countryside from sprawl, and it gives everyone a chance to have their say.."
"The National Planning Policy Framework sets out government's planning policies for England and how these are expected to be applied"
"promote growth without compromising the things that we, and our millions of visitors, love about North Somerset: our beautiful countryside, stunning coast and distinctive towns and villages, each with their own unique character. Only a modern, efficient council providing a strong voice for the area can achieve this." "Ensure that council activities in local councils’ areas take account of the Neighbourhood or Parish Plan"
"This consultation is on an initiation document setting out the proposed scope and programme for the preparation of the North Somerset Local Plan 2018-2036. The existing timeframe for planning documents within North Somerset is to 2026. This is the end period of both the Core Strategy and the more detailed Sites and Policies Plan"
"The Core Strategy is the main planning document which guides development choices and decisions in North Somerset. NSC are to build 20,986 dwellings by 2026. "New housing development 2006–2026 will be accommodated in accordance with the following hierarchy ... Other settlements and countryside 985" i.e. in areas such as Bleadon. "Development outside the areas covered .... will be strictly controlled in order to protect the character of the rural area and prevent unsustainable development. Residential development at Infill villages. ... Affordable housing will be permitted within settlement boundaries or in the form of rural exceptions sites, adjacent to settlements." "The sites and policies plan contains detailed policies that complement our [NSC] Core Strategy. A first draft was produced in February 2013, but due to uncertainties over our strategic housing requirement, the sites and policies plan has been split into two parts." "Part 1 of the plan, development management policies, has been taken forward in advance of part 2. It covers a range of development issues including development in the green belt, major transport schemes, conservation areas, extensions to dwellings, development in the countryside, retailing, accommodation for older people, minerals planning and design." Development Management Policies July 2016. "Where appropriate, proposals should seek to conserve the local natural environment by retaining, protecting, enhancing and linking existing wildlife habitats; by incorporating retained habitats sensitively into the development through appropriate design; and by ensuring that such retained and enhanced habitats are managed appropriately." "To ensure that development would not harm the natural beauty of the AONB and that the priority consideration for all proposed development impacting on the AONB is the conservation, protection and, where possible, enhancement of its natural beauty." "Restrict isolated residential development in the countryside unless there are special circumstances such as replacement dwellings and protect the countryside from inappropriate sized dwellings that would harm the character of the area"
DM45(July 16) - The conversion or re-use of rural buildings to residential use. "Restrict isolated residential development in the countryside unless there are special circumstances such as the conversion of rural buildings." "Restrict isolated residential development in the countryside unless there are special circumstances such as essential rural workers dwellings." "To support proposals for new agricultural buildings which are genuinely necessary and ensure that any new building which is permitted meets very high design standards and respects the landscape and its rural setting"
"To prioritise the re-use or existing sites and buildings for the above uses in order to protect the character and appearance of the countryside." "To prioritise the redevelopment of redundant sites and buildings in the countryside for economic and community uses." "Following consultation on the publication version the site allocations plan was submitted to the planning inspectorate for examination on 24 February 2017 ... WeNSC] currently consulting on proposed modifications to the plan following the examination hearings." "This consultation will open on Monday 18 September and comments must be received no later than 11.59pm on Monday 30 October 2017." See also NSC SAP SD8 Residential Site Assessment 2016/17 and SAP SD10 Facilities Accessment 2016/17 spreadsheet downloads. A comparison of Neighbourhood Plans, Parish Plans and Village Design Documents by Stratford-on-Avon District Council. "If you are happy with the Local Plan and the emerging Core Strategy, you may decide that there is no need to prepare a Neighbourhood Plan. If you feel that the policies do not fully address what you would like to happen in your community, as you would like more development than is suggested, or your community would like things to happen more quickly, then you could consider preparing a neighbourhood plan." Could a NSC Strategic Gap help stop WSM urban sprawl consuming Bleadon and making it a suburb? Five Problems with Neighbourhood Plans (Feb 17) "The real effects of neighbourhood plan making on housing delivery and on the efficient, democratic operation of the planning system are hard to pin down and yet the Government continues to champion its role. Are we really heading in the right direction?" There are around 11,000 local councils in the UK, including town, parish, community, neighbourhood and village councils. Communities "are able to choose where they want new homes, shops and offices to be built, have their say on what those new buildings should look like and what infrastructure should be provided, and grant planning permission for the new buildings they want to see go ahead ... where the ambition of the neighbourhood is aligned with the strategic needs and priorities of the wider local area"
"Where a parish or town council chooses to produce a neighbourhood plan or Order it should work with other members of the community who are interested in, or affected by, the neighbourhood planning proposals to allow them to play an active role in preparing a neighbourhood plan or Order. The relationship between any group and the formal functions of the town or parish council should be transparent to the wider public ... The terms of reference for a steering group or other body should be published and the minutes of meetings made available to the public." One of the key documents to understanding the Government's plan for housing is 'Localism Bill: Neighbourhood Plans and Community Right to Build (Jan 2011 Impact Assessment)', which outlines Option 3, cost savings of £1.345billion, the NDP and speeding up of the planning process. "There are also costs of reviewing the plan – estimated at an average 70 per cent of the original costs of the plan – every 10 years" "The cost of preparing a neighbourhood plans will be met partly by the local authority and partly by the promoters of the neighbourhood plans. In the initial years, there will be some financial support from Central Government. 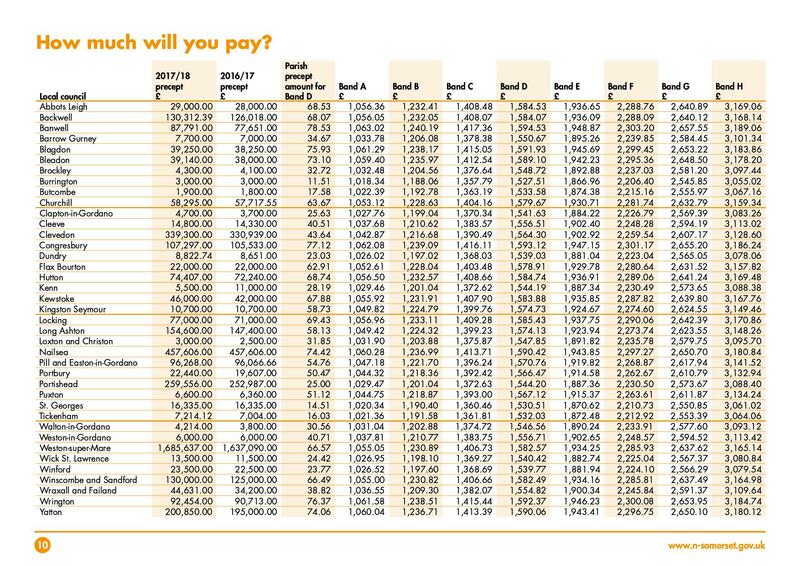 The average costs are estimated at £17,000 to £63,000 per plan." Also includes information on Net Benefit, or the economy, local authorities, developers, planning inspectorate and communities. Cornwall Council gives guidance on costs in 2013 indicating "The average costs are estimated by the Department of Communities and Local Government (DCLG) at £20,000 to £86,000 per plan." Link to Neighbourhood Plan information extracts and BOB and process table. "Town and parish councils can prepare planning policies for the development and use of land in their area. They can allocate sites for development but should not promote less development than the existing local plan." i.e. promote more development than NSC and/or equal? Currently 21K houses by 2026, more afterwards. "Neighbourhood Plans are optional documents that detail further development priorities for individual communities. They are community-led and can be written by town or parish councils" Parish Plans can be submitted as supplementary documents. Purbeck District Guide to Neighbourhood Planning. "The Government is introducing the idea of the neighbourhood plan building on the parish plan. "Community (Parish or Town) Plans might be led by the local council, drawing in community groups, residents and others, to produce an action plan for improving the local quality of life and the environment. These plans can be based on the findings of a variety of consultation exercises and can form the basis of neighbourhood plans"
"... consider the delivery of services and community rights, review your council’s role in the planning system including neighbourhood plans and introduce parish plans." No mention of Parish Plans but "Neighbourhood plans are written by parish or town councils or neighbourhood forums. They are a tool to give communities more influence over the type, location, size, pace and design of development in their area (providing it fits with local and national policies). These plans become part of the development plan for the area once they have been passed by an examiner and ratified by the community through a referendum [NB There is no minimum turnout figure!! LGA FAQ #26]. Councillors can encourage communities to take advantage of this tool, help them to understand the process, act as a liaison with the council and contribute to the development of proposals in their ward or division." How much will a Neighbourhood Plan Cost? "You can receive grants and support to help you complete your neighbourhood plan. There are two types of support available in the 2015-2018 programme: Grants of up to £9,000; Technical support packages provided by our partner, AECOM, and an additional grant package of £6,000 (bringing the grant ceiling amount available to £15,000) ... The Neighbourhood Planning Grants will close on 31 January 2018, with the expenditure deadline being 31 March 2018." If this is a grant towards the full cost what will be the final cost and effect on residents' precept includeding defence of any challenge? "Producing a neighbourhood plan involves a lot of complex tasks and stages." The My Community Locality website offers a project planner, which outlines these core tasks and stages. "The completed project planner must also be submitted with neighbourhood planning grant applications. If this hasn’t been completed it will delay the grant assessment process." The Planner clearly shows that the submission of a Designated Area comes after public awareness and consultation. The views of a person from Sandford/Winscombe indicate that it could be costly. See also the Planning Inspector's report with regards sustainability. BPC correspondence and BOB notes on the NDP can be found here. Bleadon Neighbourhood Plan Application for the Designation of a Neighbourhood Area submitted 15 Sept 2017. What happened to "Neighbourhood planning is not a legal requirement but a right which communities in England can choose to use. Communities may decide that they could achieve the outcomes they want to see through other planning routes ... Communities and local planning authorities should discuss the different choices communities have to achieving their ambitions for their neighbourhood"? BPC Autumn Newsletter #107 stated "Settlement boundaries, village plans and even some new neighbourhood plans have been shown to be irrelevant or at best to hold very little weight in current national planning decisions ... All villages are now being encouraged to produce new neighbourhood plans by the end 2019 which will cover issues such as planning"
My Community Locality "The new and improved Help Centre is now able to provide you with better access to all forms of advice and support on community projects and plans, neighbourhood planning, community business and more." Forum for Neighbourhood Planning "This website supports people and communities who are using new powers under the Localism Act 2011 to create neighbourhood plans." Below are some informative links from CPALC but you may need a membership to read more fully. Daws Hill Neighbourhood Forum goes to court over neighbourhood plan changes Who Pays? 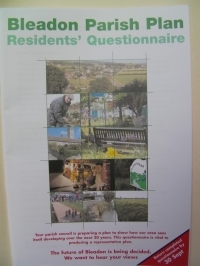 Bishop Tawton Neighbourhood Plan issue Who Pays? Burnham-on-Sea, Highbridge and Burnham Without Neighbourhood Plan. See also Newspaper Articles section below. "Influence how local services are delivered. Parish Plans are an important tool that can be fed into other plans and strategies such as Local Plans.."
Good Councillor Guide (2006) for Parish Councillors "The parish council needs to understand the procedures by which the planning authority makes decisions. Some decisions are made by the authority’s planning committee, while many are delegated to officers. Central to the decision making process are material considerations - issues that are, in law, material or relevant to a planning application. Such matters must be taken into account when making a recommendation on a planning application. Material considerations include: ... parish plan" In Jan 2017 BOB suggested BPC submit the Bleadon Parish Plan as a Supplementary Document as suggested by NSC at the Bleadon Hill Inquiry. We have not received a response despite chasing this in Sept 2017. "A parish plan is a community plan and not a land use plan. It is a set of policies and an action plan for the next few years covering a much wider range of issues such as housing, the local economy and transport. It is a good idea to draw up a plan, whatever the size of your community. The plan should be developed in consultation with thelocal community." 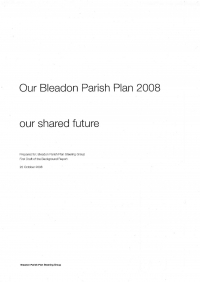 Does not mention Parish Plans only Neighbourhood Plans? "The New Homes Bonus (NHB) was introduced by the Coalition Government with the aim of encouraging local authorities to grant planning permissions for the building of new houses in return for additional revenue. Under the scheme, the Government has been matching the Council Tax raised on each new home built for a period of six years. ... The development of each additional affordable home attracts an enhancement of a flat rate £350 per annum ... From 2017 a national baseline for housing growth will apply of 0.4%. Below this, the NHB will not be paid. The aim of this change is to ensure that “the money is used to reward additional housing rather than just normal growth” ... The number of years for which payments are made will be reduced from six to five years in 2017-18 and reduced further to four years from 2018-19. The funding released from this measure will be retained by local authorities to contribute towards adult social care costs “recognising the demographic changes of an ageing population, as well as a growing population”." An article written in Feb 2011 indicated that minister Grant Shapps said "Rather than feeling the strain of new homes through extra pressure on local services local residents will feel the direct benefit as they get to choose how the money is spent". This has now been changed to "The funding released from this measure will be retained by local authorities to contribute towards adult social care costs"? "The New Homes Bonus is a grant paid by central government to local councils to reflect and incentivise housing growth in their areas. The New Homes Bonus is currently paid each year for 6 years. It is based on the amount of extra Council Tax revenue raised for new-build homes, conversions and long-term empty homes brought back into use. There is also an extra payment for providing affordable homes.... The New Homes Bonus is payable where empty homes are brought back into use." "The change in government policy for the funding of social care has led to a 3 per cent levy being applied to council tax bills, along with a general council tax increase of 1.75 per cent as a result of reduced central government funding." "Neighbourhoods that take a proactive approach by drawing up a neighbourhood development plan, and securing the consent of local people in a referendum, will receive 25% of the revenues from the Community Infrastructure Levy arising from the development that they choose to accept." The CIL is 15% without a Neighbourhood Plan. What would BPC use this money for? There are two types of support available in the 2015-2018 programme: Grants of up to £9,000; Technical support packages provided by our partner, AECOM, and an additional grant package of £6,000 (bringing the grant ceiling amount available to £15,000) ... The Neighbourhood Planning Grants will close on 31 January 2018, with the expenditure deadline being 31 March 2018." If this is a grant towards the full cost what will be the final cost and effect on residents' precept? The views of a person commenting on the Sandford & Winscombe designated area/plan indicate that it could be costly. Penrose MP responds to BOB's brownfield query via DCLG "... each local authority is required by law to create an easy-to-access Brownfield Register and publish it on its website by 31 December. However, only sites suitable for new homes are to be included" Where are NSC in this process, when will it be available for residents, developers to use? "We are one of 78 local authorities across England to take part in a pilot project for brownfield registers. As a pilot authority we have followed the proposed guidance and created a pilot register." "To investigate the extent to which brownfield is a viable option for development, CPRE commissioned construction analysts Glenigan to compare the speed of residential development on brownfield sites with development on greenfield, once these sites have been granted planning permission." "Brownfield land that is considered suitable for housing development has the capacity to support at least one million new homes ... current measures are not enough to increase brownfield development and protect sensitive green spaces from development in the long term"
What will happen after our agriculture green fields have been built on? "The UK’s main public funders of food-related research are working together through the Global Food Security programme to meet the challenge of providing the world’s growing population with access to safe, affordable and nutritious food, all of the time and in ways the planet can sustain into the future." CPRE also submitted comments to NSC for the Pre-commencement Document of the new Local Plan 2018-2036, asking "In terms of the scope of the proposed Local Plan, we would wish to see included, Landscape, Quality of land, Food production (linking to the new food district), and Lighting (new CPRE maps have been produced showing the status and impacts across the country including North Somerset). CPRE also encourage the use of local foods. It was announced that Weston General Hospital’s A&E department would be closed overnight after inspectors deemed the service was ‘not safe’. The hospital’s A&E therefore will be closed between 10pm and 8am from July 4 2017. BPC Aug 17 (Mins 298.13) "It was unanimously agreed to write to the Chief Executive of Weston General Hospital highlighting the Parish Council objection to the closure of the A&E Department and copying the Local MP and Minister of Health into the correspondence." No access to the letter sent on behalf of residents, or reply from Hospital or MP yet minuted. "How do you convey your fears to the powers that be in a way that persuades them that your point of view is the right one? How do you avoid being accused of 'Nimbyism?' And how do you put up a decent fight against a developer who more often than not is experienced and highly skilled at presenting their case in the best possible light, and offering an argument that even the most reluctant planning officer would struggle to disagree with? Lwt me tell you: it IS possible"
"This note is designed to help a lay person to object effectively to development of which they disapprove. It is rarely cost effective to seek professional help in formulating a planning objection, and so I have endeavoured to give fairly full advice in this note to enable you to make your own objection and to pursue it through the Council’s planning procedures and also, if necessary, through the appeal process." What is a valid objection to a planning application? NSC is encouraging Bleadon to create a NDP via our Ward Councillors who cover Locking and Hutton. If NDPs have been around since 2011, and it is considered by BPC to be the most appropriate way to defend a village from unwanted development, then why haven't Locking and Hutton (Infill) villages got NDPs too? What was their rationale for not having a NDP? Why do they have a Strategic Gap allocated instead (as seen below)? What can Bleadon learn from their decision making? 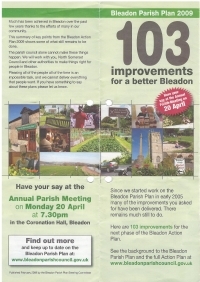 NB As far as we can tell Bleadon is currently the only infill village moving towards a NDP in North Somerset i.e. without a partnership with another community. 3.243 Between: ● Weston-super-Mare and Hutton; ● Locking and Hutton; ● Weston-super- Mare and Locking; ● Congresbury and Yatton; ● Weston-super-Mare and Uphill; ● Nailsea and Backwell. ● Weston-super-Mare and St Georges; This list is not exhaustive and other areas might be designated through more detailed planning policy documents"
Did our District/Ward and/or Parish Councillors ensure WSM and Bleadon was discussed and protected by the Core Strategy, including the possibility of a Strategic Gap, if so please can BPC publish this information? NSC still indicate in their October consultation "No change is proposed to either policy CS6 (Green Belt) or CS19 (Strategic Gaps) but changes are proposed for ... CS33 (Smaller settlements and countryside)". The current SAP consultation closes on 30 Oct 17, what is BPCs response? UPDATE Oct 17 Min (300.21) SAP response refers only to the Sanders site as a Strategic Open Space. "The assessment allows a settlement hierarchy to be established. Identifying which settlements are relatively more sustainable through the hierarchy will help us decide which are most suitable to accommodate additional growth. We need to actively manage patterns of growth to make the fullest possible use of public transport, walking and cycling, and further focus significant development in locations which are, or can be made more sustainable. Settlements that are sustainable places to live need to have enough homes to support local facilities, and new facilities can improve the quality of life in villages" An extract for Bleadon. There are only 13 Infill Villages identified in the whole of North Somerset as indicated in NSC Core Strategy (2017), CS33. Development in these villages, Bleadon included, "will be strictly controlled in order to protect the character of the rural area and prevent unsustainable development." "The four West of England Councils – Bath and North East Somerset, Bristol City, North Somerset, and South Gloucestershire are working together to produce a West of England Joint Spatial Plan (JSP) which will set out a prospectus for sustainable growth to help the Region meet its housing and transport needs for the next 20 years, to 2036. The JSP is the first such joint planning approach in the UK, which takes into account the impact that development in one area has across council boundaries. The JSP will set out the policies and principles that have been applied in determining the most appropriate and sustainable locations for future development. The plan is the product of more than two years joint working and two previous consultations, where individuals, communities and stakeholders have made contributions to help shape the future growth of the region. Previous consultation papers can be found at the bottom of this page. The four councils now propose to submit the Joint Spatial Plan to the Secretary of State for Communities and Local Government for examination. Before this happens, residents, businesses, the development sector and other stakeholders have the opportunity between 22 November 2017 and 10 January 2018 to comment on the plan and make representations on its soundness. These comments and views will be passed on to the Planning Inspector who will assess the plan"
" CPRE comments on the new Local Plan timescale in relation to the JSP (July 2016) i.e. "North Somerset needs a period of stability in terms of Strategic Planning and not to be chasing a timetable of a new plan that meets the need of the JSP." Additional documentation on the JSP Consultations and Responses and Technical Documents and Evidence Base are also available. "NSC will consider implications of housing need from both Bristol and Bath HMAs to be allocated across West of England area ... including about 10,000 dwellings in NSC ... Work has commenced on a new local plan -to be prepared in parallel with JSP. Will cover period 2018-2036.Target for adoption 2019 ... Opportunity to work closely with Neighbourhood Plans ... 20,985 dwellings( 2006 -2026) 8,000 dwellings built up to 2016. Settlement boundary policies relaxed". "The majority of new homes (57,500) are set to be built in South Gloucestershire and North Somerset – 32,500 and 25,000 respectively – as these authorities have more space. Bristol and Bath will take on 48,000 collectively at sites towards the North East of Bristol." "The production of the JSP requires work to progress on a new Local Plan in parallel with it, in order to provide detailed policies and additional housing, employment and other land allocations beyond 2026 and up to the new 2036 end date"
"Given the decision by North Somerset not to accept a Metro Mayor, and the impact on the ‘devolution deal’, this must also impact on the relationship with the West of England Joint Spatial Plan and must generate the need for a review. North Somerset needs a period of stability in terms of Strategic Planning and not to be chasing a timetable of a new plan that meets the need of the JSP." "brings together representatives from village action groups to give a communal voice to those living in rural North Somerset who want to curb the urban sprawl threatening to overwhelm the countryside. The group provides mutual support to demonstrate the strength of opinion within the service / infill villages Churchill, Congresbury, Claverham, Langford, Sandford, Winscombe, Wrington and Yatton"
Most members of NSVA are designated 'Service' villages except Sandford that has 'Infill' status like Bleadon. Although despite applying for a Neighbourhood Plan with Winscombe (service village) an appeal was lost in October 2016 for 118 dwellings. All Neighbourhood Plan applications currently being prepared by NSC seem to be for Service Villages, except Bleadon (Sandford is part of Winscombe Parish)! By LGiU - Local Democracy Think Tank. "all about people and the places where we live: ... the everyday essentials that make life work – health, schools, homes, jobs, support, open spaces and the rest. And the thread that weaves through all our work is our core belief that all these essentials are best when they are designed and delivered locally." See the Local Government Facts and Figures e.g. 11K Town, Parish and Community Councils in the UK. Also, What is Local Government Responsible For? "Legislation concerning local government in England is decided by the Parliament and Government of the United Kingdom, because England does not have a devolved parliament or regional assemblies, outside Greater London"
Parish Councils in England "A parish council is a civil local authority found in England and is the lowest tier of local government. They are elected corporate bodies, have variable tax raising powers, and are responsible for areas known as civil parishes, serving in total 16 million people. A parish council serving a town may be called a town council, and a parish council serving a city is styled a city council; these bodies have the same powers, duties and status as a parish council." Bleadon is the subject of a number of major development so who represents residents' views and protects our rural village community and countryside environment? BOB submitted queries to BPC during the Bleadon Hill Inquiry about how to protect Bleadon from forthcoming major development. We are still waiting for a considered response and in the meantime BPC have implemented their vexatious policy until Feb 2018 to avoid answering. "International and national bodies have set out broad principles of sustainable development. Resolution 42/187 of the United Nations General Assembly defined sustainable development as meeting the needs of the present without compromising the ability of future generations to meet their own needs. The UK Sustainable Development Strategy Securing the Future set out five ‘guiding principles’ of sustainable development: living within the planet’s environmental limits; ensuring a strong, healthy and just society; achieving a sustainable economy; promoting good governance; and using sound science responsibly." an environmental role – contributing to protecting and enhancing our natural, built and historic environment; and, as part of this, helping to improve biodiversity, use natural resources prudently, minimise waste and pollution, and mitigate and adapt to climate change including moving to a low carbon economy." NSC has 39 Town/Parish Councils (see attached and note Bleadon Band D Precept relative to similar population villages), of these 13 have applied for NPs and 2 have been published. Bleadon is the sole 'infill' village that has applied for a NP. Sandford is also classed as 'Infill' but is part of Winscombe & Sandford Parish Council. They too applied for a Neighbourhood Plan but despite this, the planning inspector seems to have ignored it's 'emerging' status as a 'block' to development and granted 118 dwellings. Of particular interest is the 'Sustainability' section. 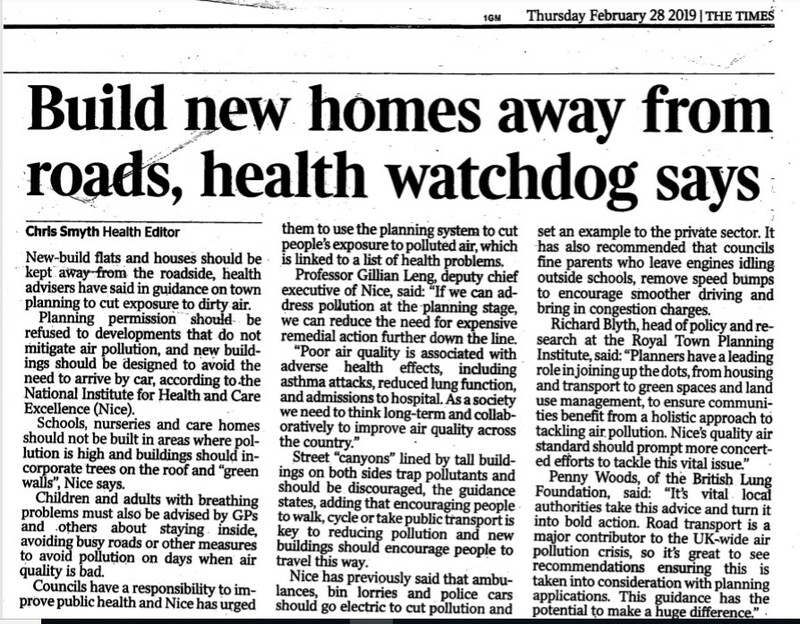 "Planning permission should be refused to developments that do not mitigate air pollution ..."
"Beware of politicians talking about affordable homes. New 'affordable' housing is not actually that affordable "
10 Aug 15 Shelter - What is Affordable Housing? "It sounds like an easy question to answer, but what makes a home ‘affordable’ has become a serious point of contention. People even get angry about it, suspicious that what is being called ‘affordable housing’ isn’t actually affordable in any real sense." 23 Nov 16 BBC - Reality Check What is Affordable Housing? "With property prices rising faster than wages, affordable housing has become a hot topic ... The government's definition when it comes to renting is that affordable homes should cost no more than 80% of the average local market rent. " 29 Aug 17 House of Commons - What is Affordable Housing? "This Commons Library briefing paper considers how affordable housing is defined in England and looks at key trends in the affordability of different tenure types. It also examines the supply of affordable housing and the role of Housing Benefit in enabling households to access and retain affordable housing." Also, "commentators questioned how affordable Starter Homes would be. The homes will be sold at a minimum discount of 20% off the market price subject to price caps of £250,000 outside of London and £450,000 within London. The Government argued that the homes built will be sold at prices substantially below the price caps, but subsequently decided not to require local planning authorities to include a minimum percentage of Starter Homes on development sites." Affordable housing is referenced in the NPPF including Annex 2 in the Affordable Housing and Rural Exception Sites sections. "Standing up for wildlife at a national and local level plays a key part in our work"
"We campaign for a beautiful and living countryside. We work to protect, promote and enhance our towns and countryside to make them better places to live, work and enjoy, and to ensure the countryside is protected for now and future generations." As a Planning Authority "You must consider how a development might affect protected species on or near a proposed development site when reviewing a planning application"
"Information for developers on how to avoid harming protected areas and species during development work"
"We're the government’s adviser for the natural environment in England, helping to protect England’s nature and landscapes for people to enjoy and for the services they provide"
"The MAGIC website provides geographic information about the natural environment from across government. The information covers rural, urban, coastal and marine environments across Great Britain. It is presented in an interactive map which can be explored using various mapping tools that are included. Users do not require specialist software and can access maps using a standard web browser." "Find data published by government departments and agencies, public bodies and local authorities. You can use this data to learn more about how government works, carry out research or build applications and services"
"Please note that this is not the definitive record and does not replace the full range of data obtained from our Land Charges services"
22 Sep 2017 Could a School and 250 houses be built in Bleadon? "Planning consultants Sutherland Property and Legal Services Ltd held an open day in Bleadon’s Coronation Hall, in Coronation Road, to get residents’ views on its proposed £15million development." 07 Aug 2017 Holiday village hopes to meet rising demand with £5 million caravan site in addition to £7 million in recent years. "Riverside Holiday Village has asked North Somerset Council for planning permission to turn its camping site into a base for 90 caravans ...current capacity of up to 400 people, across the campsite and in static and touring caravans ... Bleadon Parish Council has said it supports the application"
25 Jul 2017 Could 16 new homes be built in a North Somerset Village? "Claremont Somerset Ltd has asked North Somerset Council for outline planning permission to build 16 houses to the land off Purn Way, in Bleadon. This is the second housing application for the village in the past month, following the outline application to build 70 homes off Bridgwater Road. [Devil's Bridge]"
24 Jun 2017 Residents fear plans to build 70 new homes in Bleadon do not take into account the 'bigger picture'. "Residents in Bleadon have voiced their frustrations after the outline plans were announced, with one person calling them ‘ridiculous’ while another is worried village services are already ‘at breaking point’." 19 Dec 2016 Growing safety concerns in village following fatal collision. "Serious concerns have been raised about the condition and safety of a country road which sees 100 lorries drive down it every day"
05 Dec 2016 North Somerset Council 'Precious landscape must be protected 'Developer Molwin Estates wants to build 79 homes off Bleadon Hill and the application will be determined by a planning inspector following an inquiry, which began on Tuesday." 31 Jul 2016 Man arrested as woman dies in road collsion. "The woman was walking her dog when she was involved in a collision with a Landrover Freelander." 16 Jul 2016 Council gears up to defend housing appeals. "North Somerset Council has admitted it is facing a 'challenge' in deciding planning applications quickly, due to the sheer number of developers hoping to build new homes within the area"
27 Jun 2016 Date set for inquiry over Weston home plan. "A date has been set for the Government's inquiry into a housing develoment on the edge of Weston-super-Mare development on the edge of Weston-super-Mare ... planning permission to build 79 homes on Bleadon Hill"
31 May 2016 Developer has second go at housing application. "Molwin Estates submitted a second planning application for 79 homes on Bleadon Hill, despite an impending Government appeal on the first application." 22 May 2016 Wooden holiday lodges plan approved. "A landowner in Bleadon applied for permission to build 57 of the huts in Accommodation Road." 19 May 2016 Weston housing application rejected "Developer Coldharbour Land Ltd applied to North Somerset Council for planning permission to build 60 houses off Wentwood Drive last year. The application attracted hundreds of objections online including from Weston Town Council – which said it was concerned the development would fill the space between Bleadon and Weston, damaging their ‘separate identities’. But the application was reduced to 50 houses and council officers subsequently recommended the plans for approval." 22 Apr 2016 Council rejects hilltop housing development "At North Somerset Council’s planning meeting last week, there was a heated debate over how the authority should respond to the application for 50 homes in Wentwood Drive, between Weston and Bleadon." 18 Mar 2016 Council to fight Bleadon homes appeal "Cllr Terry Porter said: “It would change the character of this area completely." 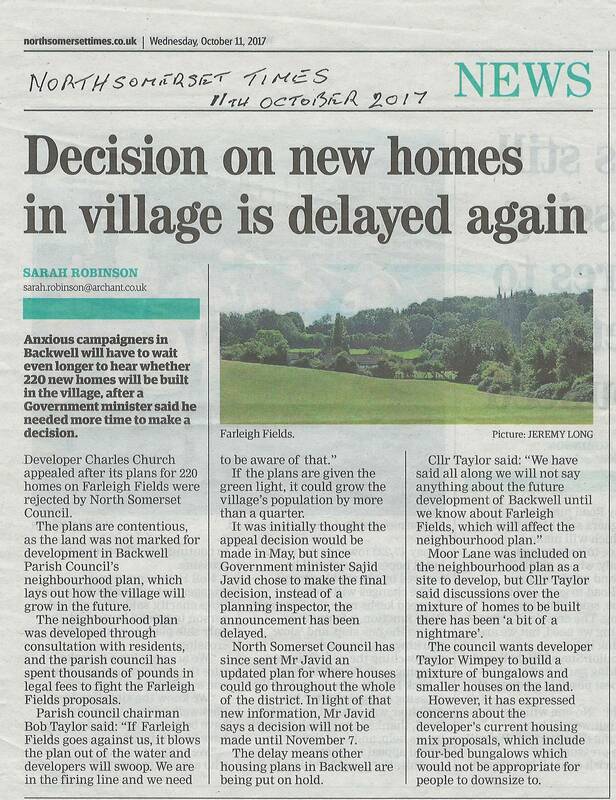 11 Oct 17 article in North Somerset Times "The plans are contentious, as the land was not marked for development in Backwell Parish Council's neighbourhood plan, which lays out how the village will grow in the future. The neighbourhood plan was developed through consultation with residents, and the parish council has spent thousands of pounds in legal fees to fight the Farleigh Fields proposals." So I will ask NSC to say what the required number of houses Claverham Plan area is supposed to provide. I believe it is part of a shared number with the remainder of the Infill Villages and Countryside, probably with a shared number of “windfall” dwellings that are just going to happen anyway." 06 Jan 2017 North Somerset Council to finally confirm plans for 20,000 new homes by 2026. "The council’s core strategy planning document outlines where 20,985 new homes will be built in the area between 2006 and 2026 – a figure which was increased from 14,000 homes after a lengthy legal challenge from Bristol University in 2013."